Hi Crafty friends, just popping in to share with you a few Christmas cards from 2014, I sent them off before I got some pics! I only made a few cards for family and close friends late last year due to being so busy, so here are just a few. 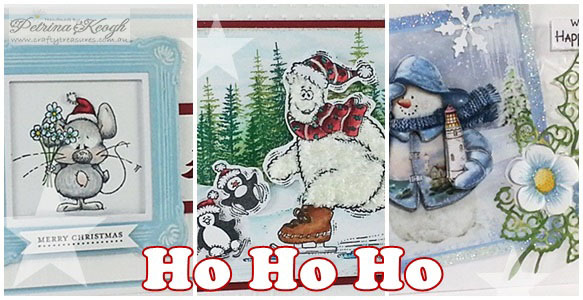 I have also started on Christmas cards for Christmas 2015, starting them earlier this year. 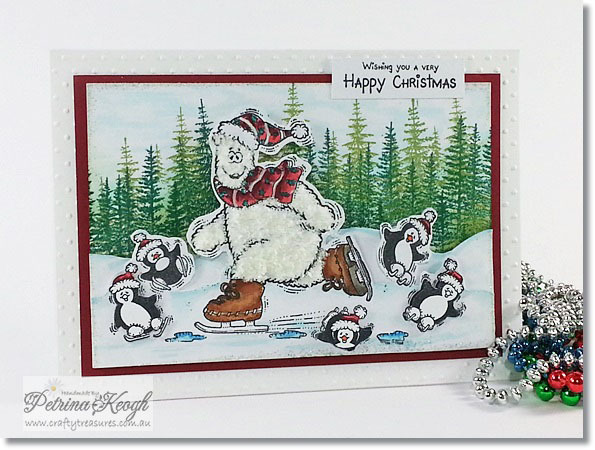 For this card I stamped up a Darice rubber stamp (Retired) which I have hardly used, that I have had for many years and coloured it with copic makers. 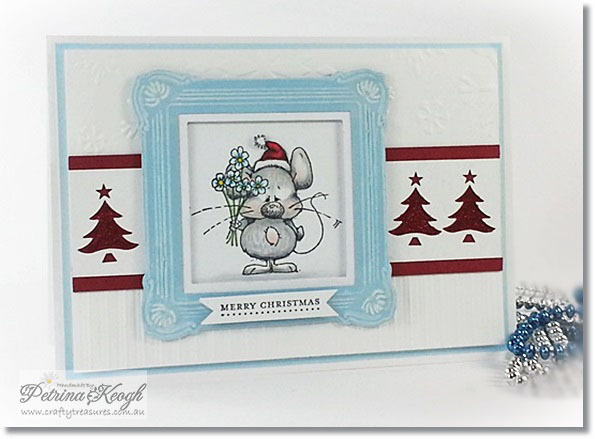 The background was stamped with stampscapes stamps, making a scene with some layering. For some fun, I adhered some faux snow to the polar bears body. I finished it off adhered these onto a dry embossed background. With this card I stamped a Whipper Snapper stamp and coloured it also with copic markers. I made a cute square frame with a Pampered Pets (rectangle) embossing folder, highlighted with white craft ink. This technique has been around for a while, I found a lovely tutorial for you here. I punched some trees on a strip and I embellished the trees with some glitter. 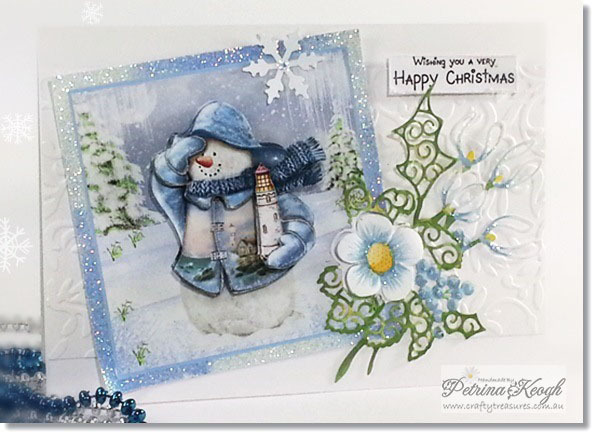 The background was dry embossed with snow flakes and some faux panels. I added a Santa hat from an old clear stamp set, I’m pretty sure is Stampendous, it’s quite old now and is starting to perish, so I have to be very gentle when I stamp with this set, as this size was perfect, just fitting in-between his ears. This card I used a lovely tattered lace die cut coloured with distress inks and a papertole image I have had in my papertole tub for many years (sorry folks I’m not sure if it’s a web freebie or a brand one?). I still enjoy papertole and still have sooo many tubs of made papertole.. bought from craft shops and shows over the years and also found freebies from online. I have slowly, over a few month’s, just finished with some papertole sheets from the Do Crafts Magazine and some Le Suh designs and a few others, I take them with me when we go places to finish a few more. My sister in-law recently asked whatever happened to the cards that looked raised, I worked out after a while.. it was Papertole! I would like to make up some gift boxed cards, using up some papertole and older cards and clear out some stuff. Great idea, I should have thought of this way back when, and write the brand/designer on the back of the made unmounted papertole, but that does not help me right this minute because back then I did not have a website, so the thought would not have crossed my mind to write it on the back, anyhow you live and learn. I dressed the outside edge of the papertole frame with glitter and adhered these to a embossed background.